A Bennington, VT woman who has devoted much of her energy to a search effort over the past three years has finally been reunited with her missing cat. 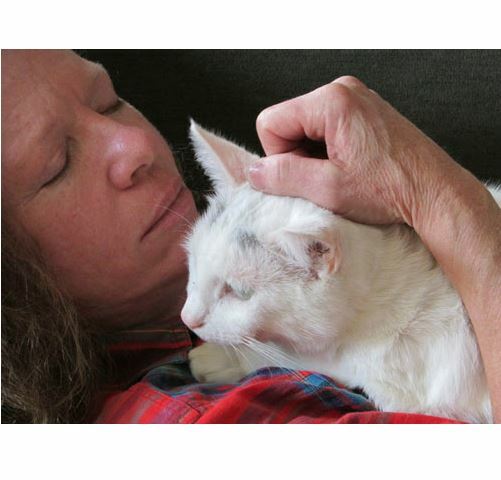 Karen Halvorsen searched relentlessly for her missing kitty Monster Cat (aka Sketti), from the day he went missing after an unfortunate decision to let him out for the first time on October 28, 2012, until she was reunited with him on October 1, 2013. Karen adopted Monster from the Second Chance Animal Shelter when he was six months old, as a companion for her other cat, Lucy, and he remained an indoors-only cat for two years. On October 28, 2010, Karen’s son and her father were working on a project outside and persuaded her to let Monster Cat out into the yard, where they could keep an eye on him. Monster wandered over to a playground across the sparsely traveled road and Karen saw a couple outside of a parked muscle car making “come here” gestures to him. Karen called Monster Cat’s name loudly to let the couple know he was someone’s cat and they were being observed. She had to turn away for a moment to check on something in the house, and when she came back out the car, the couple and her cat were gone. The search for Monster cat began right then and there. In addition to putting up posters, Karen took out a classified ad in the local paper, the Bennington Banner, which ran regularly, with the result that Monster Cat and the search were well and widely known. Much of the information and potential leads garnered from the classified ad came mostly from the Adams, MA area, south of Bennington. Karen researched muscle cars, and studied cats’ responses, habits and behavior. She studied maps, having learned that cats sometimes follow railroad tracks and feed off of animals hit by the trains. When she traveled to pursue leads, she brought Monster Cat’s favorite pillow, with his scent and fur on it, and made the familiar sounds of food being opened and put into a bowl. By nature a rational thinker, she even turned to a crystal to send positive thoughts and consulted a psychic. 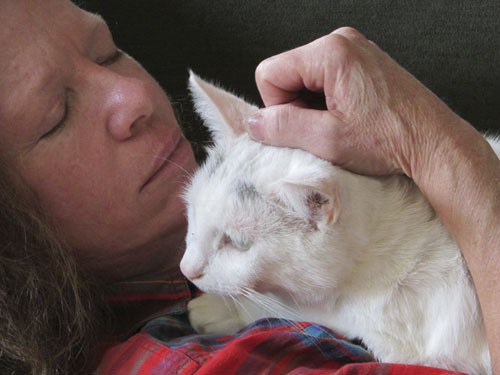 She pursued any and seemingly every approach to find her missing cat and felt she couldn’t give up on her cat any more than she could give up on her children. Adams, MA residents feeding a stray cat, Facebook and a nearby cat rescue led to Monster Cat’s recent homecoming. The people in Adams who spotted the stray tagged Kaila Drosehn from Northern Berkshire Cat Rescue in a photo posted to Facebook, looking for help for the bedraggled, flea infested cat, who they felt resembled Monster Cat. Despite a lack of funds at the rescue, Drosehn took the cat and made sure he saw a vet, paying out of pocket for treatment at Wahconah Veterinary Hospital. The cat suffered severe anemia from the flea infestation and had scratched himself raw, and he was vomiting up parasites. It was not known at first whether he’d live. Drosehn rescued the cat on September 6 but waited to contact Karen Halvorsen until he’d begun to show good signs of recovery. Karen brought Monster Cat’s pillow along when she went to see the cat. The animal she saw didn’t look the same as Monster had in his better days, but he responded to his pillow and then he recognized her. Though he was not fully recovered, monster cat went home with Karen and will continue to recuperate there.